A one-world government is a goal popular with liberals, globalists, and others ranging from the moderate "Right" to the Left and far-Left, in which all the nations on Earth will (supposedly willingly) abandon their sovereignty to the will of the United Nations or some other worldwide government. Liberals and globalists see this as a utopian goal, while opponents see it as a dystopia. A one-world government is an ultimate goal of the Left. They believe in the concept that humanity is progressing for the better, and they want to create a utopia where humanity is unified and where there are no wars, conflicts, or borders (cultural and national). 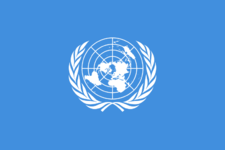 Supranational organizations such as the United Nations, European Union, World Trade Organization, and the Paris climate agreement, appear to be the forerunners to a complete one-world government. All these organizations are supported by liberals. A one-world government is the epitome of big government. Many theologically conservative Christians believe that the Earth will be united under a one-world government, based on Scripture. In the popular Left Behind series, the Antichrist begins his plan by subsuming America into the One-World Government. This is based on the Book of Revelation. Theologically conservative/orthodox Christians believe that the ultimate reason for the push for globalism and one-world government is rebellion against God leading up to the Antichrist – rather than submit to God and recognize that only He can unite the world and bring world peace, liberal globalists seek to create utopia themselves and glorify humanity rather than God. Some people believe that U.S. President George H. W. Bush's "New World Order" speech was a clue that the insiders were about to begin their plan to ultimately establish a one-world government. Similar to how the vast majority of people opposed homosexuality and its legalization 50 years prior to its actual legalization, acceptance, and encouragement by society; many people do not believe a one-world government is a realistic or serious idea that could happen in the coming centuries. However, compared to the international situation in the past, such as 1300, 1700, or even 1900 AD, the world in the early 21st century is significantly more culturally, economically, and politically unified than ever, and becoming increasingly so. The vast majority of the world's nations belong to the United Nations (which has an expansive bureaucracy), the Paris climate agreement, and the World Trade Organization, among other organizations. Leaving these organizations is considered taboo. Additionally, cultural and economic unification is key to establishing a political one-world government, as can be illustrated in the case of the European Union, which established economic unity prior (free trade, single market) to political unity (no borders, unified currency, common military). Common weights and measures, such as the Metric System, and other forms of economic unification, such as time zones and free trade agreements, are used worldwide, and leaving any of these is considered taboo, detrimental, or even practically unheard of. While many of those who either disbelieve or deny the existence of a "War on Sovereignty" imagine it as a very speedy attempt to instantly unite the world into a global government, those who are actively pushing for a one-world government are pursuing a relatively longsuffering strategy that will slowly merge all the countries of the world into each other prior to the official establishment of any world government. They believe this strategy to be the only way it can be successfully achieved. Zbigniew Brzezinski, Jimmy Carter's National Security Advisor, an Obama campaign advisor, and a member of the Council on Foreign Relations and Trilateral Commission, admitted this, stating that "we cannot leap into world government in one quick step. The precondition for genuine globalization is progressive regionalization." Organizations such as the EU and NAFTA are examples of this "progressive regionalization." Additionally, Richard N. Gardner, a former State Department official, wrote in 1974 that a world government could not be established in one step. Rather, he argued that "in short, the ‘house of world order’ will have to be built from the bottom up rather than from the top down," and that "an end run around national sovereignty, eroding it piece by piece, will accomplish much more than the old fashioned assault." Gardner's strategy has been fully adopted by globalists, and international organizations such as the World Bank, International Monetary Fund, World Trade Organization, Paris climate agreement, and the numerous disarmament treaties are all examples of this strategy in action – eroding sovereignty bit by bit until all the countries of the world are so integrated by the complicated web of international organizations and treaties that the official establishment of a world government can be accomplished seamlessly and would rather be a mere recognition of de facto reality. Sometimes, the push for global government is concealed behind another stated priority. For example, the UN's programs intended to fight climate change will ultimately result in socialist policies and a world government. Concert of Europe (ca. 1815–1823) – first system, at least in Europe, where nations meet together to resolve disputes and maintain a balance of power. A precursor to the League of Nations and United Nations. End of World War II. A dominant liberal world order now clearly exists (even though it could be easily seen at the end of World War I), at least among the Western nations. Much talk among Europeans and their leaders over a "United States of Europe"
Dissolution of the Soviet Union and the end of the Cold War (1991). End of the bipolar world order and the beginning of a unipolar or multipolar order, where the world generally had a degree of cooperation and unity with the occasional rogue state (they are called "rogue states" for a reason). NAFTA (1994). Globalist politicians discuss creating a "North American Union." Millions of refugees pour into Europe. Leftist politicians want to fulfill their dream of a multicultural society rather than help refugees (2015/2016). The UN releases its 2030 Agenda for Sustainable Development strategy, which threatens national sovereignty. Paris climate agreement is formed, with nearly every nation in the world being a party to the treaty (2015). Two years later, the United States announces its intentions to withdraw and end implementation, but not without massive protest and pressure from the rest of the world (note that the opposition occurred even despite Trump not choosing to withdraw from the underlying UN treaty). United Kingdom votes to leave the EU, and yet the socialistic organization pushes further towards federalism. Two years later, in 2017, the EU agrees on a plan to create a unified military. ↑ Does the Bible prophesy a one-world government and a one-world currency in the end times? GotQuestions. Retrieved March 18, 2017. Hohmann, Leo (October 16, 2016). Is Globalism Actually Demonic? WND. Retrieved December 26, 2017. Castle, Darrell (May 7, 2018). The Global Collective – Our New God. Conservative News and Views. Retrieved May 7, 2018. Should a Christian be opposed to globalization? GotQuestions. Retrieved December 26, 2017. ↑ Newman, Alex (August 20, 2013). The EU: Regionalization Trumps Sovereignty. The New American. Retrieved November 25, 2017. ↑ 5.0 5.1 Perloff, James (July 23, 2009). Council On Foreign Relations. The New American. Retrieved November 27, 2017. McManus, John F. (July 17, 2009). Hillary Clinton Lets CFR Cat Out of the Bag. The New American. Retrieved December 31, 2017. Gardner, Richard N (April 1974). The Hard Road to World Order. Foreign Policy. Retrieved January 7, 2018. ↑ Newman, Alex (January 8, 2018). Deep State Behind the Deep State: CFR, Trilaterals, Bilderbergs. The New American. Retrieved January 9, 2017. ↑ Newman, Alex (August 19, 2018). UN “Environmental” Schemes Advance World Government. The New American. Retrieved August 19, 2018. ↑ Ludwig, E. Jeffrey (November 5, 2018). The United Nations wants a one-world government in less than twelve years. LifeSiteNews (from the American Thinker). Retrieved November 6, 2018. ↑ Hallett, Nick (June 29, 2016). Just Days After Brexit, EU Releases Plan For Further Expansion, An EU Army, AND Turkish Membership. Breitbart. Retrieved October 14, 2016. Newman, Alex (November 21, 2017). EU Super-state Agrees to Plan for EU Military. The New American. Retrieved November 25, 2017. Duke, Selwyn (June 26, 2018). EU Takes Major Step Toward “European Army”. The New American. Retrieved June 26, 2018. Newman, Alex (November 14, 2018). Euro-Globalists Pursue EU Military for “Empire of Peace”. The New American. Retrieved November 14, 2018. What is the New World Order? GotQuestions. Retrieved March 18, 2017. Should a Christian be opposed to globalization? GotQuestions. Retrieved March 18, 2017. Does the Bible say the United Nations will have a role in the end times? GotQuestions. Retrieved March 18, 2017. Byas, Steve (December 19, 2018). History of Push for Global Order Revealed in Latest Foreign Affairs. The New American. Retrieved December 19, 2018.